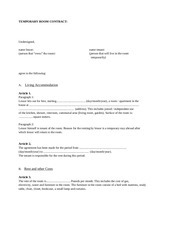 This PDF 1.5 document has been generated by Microsoft Word / , and has been sent on pdf-archive.com on 17/08/2017 at 14:47, from IP address 109.152.x.x. The current document download page has been viewed 104 times. which lessor will return to the room. The tenant is responsible for the rent during this period. table, chair, closet, bookcase, a small lamp and curtains. 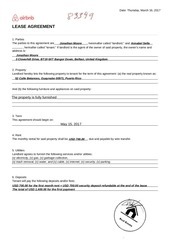 agreement), the lessor will pay back the security deposit within one month. ................................................................................. of the lessor with the ............................. bank. The lessor is obliged to make the room available to the tenant in a clean state and with no defects. neighbours. When the tenant leaves the room it should be clean and with no defects. 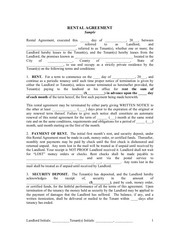 The tenant is responsible for the rent during the period stated in article 2. This file has been shared by a user of PDF Archive. Document ID: 00649717.